The organization that I work for is leveraging SharePoint heavily due to its nature of it being a collaboration platform. Much like we leverage BizTalk to minimize the amount of custom work to integrate, we leverage SharePoint to reduce the amount custom work to collaborate. We currently run MOSS 2007 and were running BizTalk 2006 so we haven't had many opportunities to attempt this integration since BizTalk 2006 only supports Windows SharePoint Services 2.0. The way I understand it, MOSS 2007 is built upon WSS 3.0 so BizTalk 2009 is capable of communicating with either WSS 3.0 or MOSS 2007. A difference between the two is that WSS 3.0 is free where as MOSS 2007 requires licenses. I am not going to further differentiate the two but will leave you with this link instead. 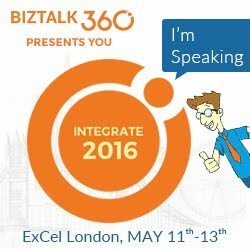 If you are already familiar with BizTalk and SharePoint integration then you may want to move on (you probably won't learn much from this post). The idea behind this post is to help out the new comers to this integration scenario. I recall having several questions when starting out so I figured putting together some answers to these questions may save some people some digging. The very first thing that you need to do before cracking open any tools or downloading any install packages is watch Mick Badran's Web cast on SharePoint integration. For those of you who don't know Mick he is a BizTalk MVP and if Microsoft allowed it he could probably be a SharePoint MVP as well. This web cast help me out tremendously! While the Windows SharePoint Services Adapter shows up in your list of adapters in BizTalk Admin, it doesn't mean that it is ready to be used. The BizTalk - SharePoint Services Adapter is not able to work all on its own. 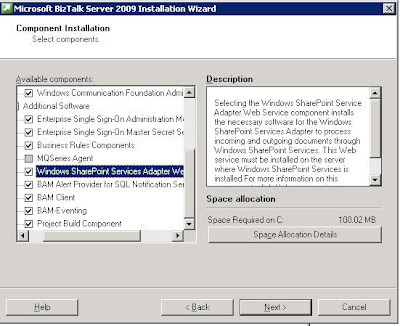 In order for you to use this adapter, you need to install the BizTalk - SharePoint Services Adapter Web Service. Confused yet? This adapter web service knows how to intelligently call the SharePoint API. 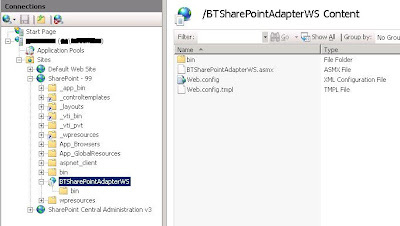 While you could call these SharePoint Web Services directly, the BizTalk Adapter abstracts this complexity away from you. You will not require any Web Service Proxies in your solutions which is a big plus. Once installed, a virtual directory will appear in your SharePoint Site. Update - You only need WSS installed on your BizTalk servers if you plan to host WSS sites on your BizTalk servers. If you plan to connect to remote WSS or MOSS servers you do NOT need WSS installed on your BizTalk Servers. Follow the BizTalk install guide! This should be a given but don't try to 'assume' your way through the install and configuration of WSS. There are some decisions like ensuring that your WSS install is part of a Server Farm even if you are running it on one BizTalk Server. Here is the link. There are some 32 bit/64bit considerations - read the fine print carefully. In distributed environments, create your AD groups/accounts ahead of time. Leverage any SharePoint resources you have available to you. I have used SharePoint, as a user, for quite some time but there is still some terminology that I am not too familiar with (Lists, Document Libraries, Workspaces, BDC etc). I had a SharePoint colleague give me a 10 minute walk through of creating Document Libraries, Custom Views etc and it went a long way. All in all I am pretty pleased with the experience. Within a couple hours I had WSS 3.0 installed, the Adapter Web service installed and configured and am pushing/pulling documents into/from WSS 3.0 via Send Port Subscriptions. Expect a few more posts on this subject as I plan on taking this topic a few steps further by integrating with InfoPath and LOB systems. Hey Kent, I see that WSS adapter is enabled only when i install WSS3.0 on my biztalk server machine. In this case i dont want as i have another machine for my Sharepoint services. Is there any way that i can install WSS adapter without installing WSS3.0 services. It is important to differentiate the WSS Adapter with the WSS Adapter Web Service. 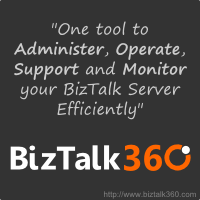 The WSS Adapter is installed with BizTalk by default and does not require WSS. However, the WSS Adapter Web Service requires WSS and must be installed on your WSS/SharePoint Server. For some people, they install BizTalk, the adapter web service and WSS on the same server. Where I work, we have a separated SharePoint farm so we installed the Adapter Web Service on the SharePoint servers only.